Sunway University, a leading not-for-profit private university, became the first higher education institution in Malaysia to pioneer the initiative and support the social enterprise. In addition to providing exclusive facilities, Sunway University Business School (SUBS) is highly involved in supporting DiD with future plans. These could include incorporating the experiential tour of DiD into a relevant study subject, specifically designed to enhance students’ empathy and social skills. This will also enable further understanding whilst building an in-depth working relationship between DiD and the students who are taking the Community Project module. Internship opportunities with DiD will also be created for students from BSc (Hons) Accounting & Finance, BSc (Hons) Business Management and BSc (Hons) Business Studies. "This is a unique way for an institute like us (Sunway University) to support such a valuable social enterprise. While extending our help to them, it will also encourage students to gain greater exposure and better understanding. 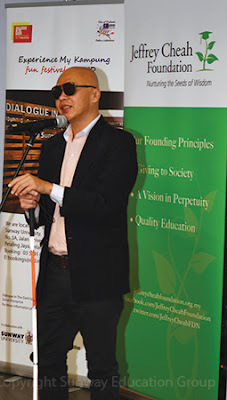 Through this concept students can experience beyond sight, learn to empathise more, along with other skills such as communication and leadership," said Associate Professor Dr Foo Yin Fah, Director of Sunway Institute for Social Entrepreneurship & Head (Academic), Department of Accounting, Banking and Finance. Dr Foo is also the key person leading the DiD project at Sunway. Supporting the launch were board members of DiD; Dr Lee Weng Keng, Chief Executive Officer, Education and Healthcare Division, Sunway Group; Dr Elizabeth Lee, Senior Executive Director, Sunway Education Group and Sunway University; Professor Steve Williams, Dean, SUBS; as well as senior management and employees of Sunway University and Sunway Education Group. Dialogue in the Dark has been relocated from its previous premise to Sunway University and is now operating from Level 11 of the Sunway University New Building. DiD is open for public with entry fees as follows: RM30 for Adult (18 years and above); RM25 for Youth (13-17 years); and RM20 for Children (7-12 years).